Following the discovery of a $14bn black hole in Parmalat’s finances in 2003, the ensuing investigation triggered an eight-year marathon of court cases across Europe and the US, disgracing the Tanzi family, causing at least one fatality and bringing one of Europe’s most successful football clubs to its knees. – During the 80s and 90s, Parmalat is hailed as the jewel of Italian commerce, as entrepreneur Calisto Tanzi converts his father’s Parma-based ham retailer into a global dairy and food giant with a speciality for long-life milk. – In 2003, bondholders learn nearly €4bn ($4.5bn) of funds being held in a Bank of America account don’t exist. The bank dubs the transfer document a forgery and trading in Parmalat shares is frozen. Calisto Tanzi, along with various family members and senior executives, is arrested. Upon entering court, Parmalat Chief Financial Officer Fausto Tonna greets journalists: “I wish you and your families a slow and painful death.” Meanwhile, at the firm’s offices, investigators discover computers have been smashed and thousands of documents shredded. 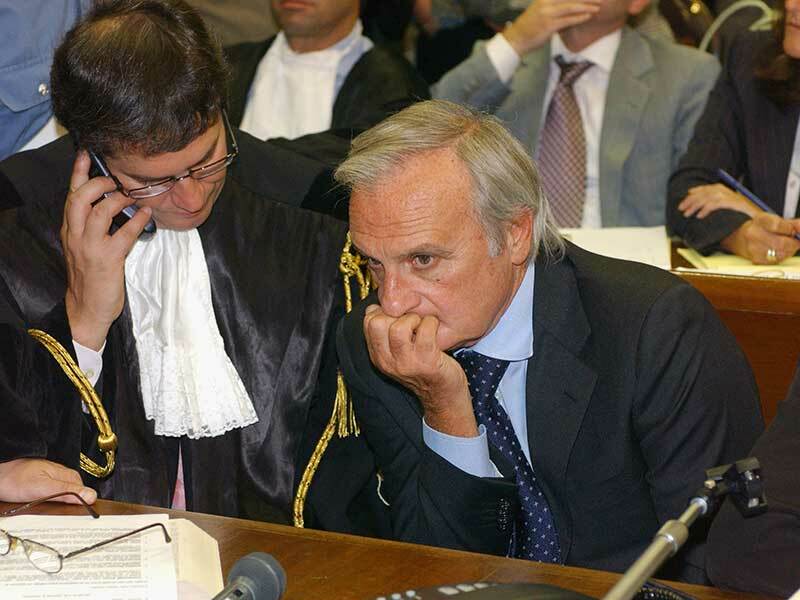 – In 2004, Parmalat’s debts are fixed at €14.3bn ($16.1bn), eight times the figure the firm had admitted to. After a series of denials, Bank of America’s former Chief of Corporate Finances in Italy, Luca Sala, admits to participating in a kickback scheme. US creditors file a $10bn class action suit against Parmalat’s former auditors, while Parmalat’s administrators – operating under replacement CEO Enrico Bondi – separately sue Bank of America, Citigroup, Deloitte Touche and Grant Thornton for $10bn each. – In 2005, Bondi relists a reconstructed Parmalat on the Milan Stock Exchange while trials continue. – In 2008, Fausto Tonna is sentenced to two-and-a-half years in jail for masterminding a complex web of offshore subsidiaries in order to hide the company’s parlous position. Bank of America, Citigroup, Morgan Stanley, Deutsche Bank and UBS all stand trial on charges of market rigging. – In 2010, 72-year-old Calisto Tanzi is given an 18-year sentence and subsequently launches an appeal. Meanwhile, under Bondi’s leadership, the new-look Parmalat recoups more than €2bn ($2.3bn) in bank settlements. – In 2011, after a three-year trial, a Milan court acquits Morgan Stanley, Bank of America, Deutsche Bank and Citigroup of market rigging. Prosecutors’ demands for €120m ($135.2m) of the bank’s profits to be impounded are met with fierce opposition and described as “the death of consumer rights”. A consumer watchdog promises to join shareholders in another case to challenge the verdict. The Italian Government blocks French firm Lactalis’ bid to takeover Parmalat.